SINGAPORE — When trade ministers from 16 Asia-Pacific countries began the latest round of talks on their proposed free trade deal Monday afternoon in Singapore, those pressing for a basic agreement on the Regional Comprehensive Economic Partnership knew there was one big hurdle standing in the way: persuading India to open its market. The negotiations, which lasted about seven hours, made progress but failed to achieve the "substantial conclusion" the ministers were hoping for. They could have extended the talks for another day before their leaders met for a summit on Wednesday, but they called a halt. 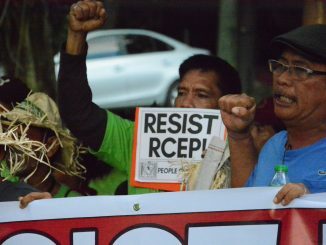 On Wednesday night the RCEP leaders gathered and agreed to aim for a final conclusion in 2019, abandoning the goal of reaching a basic agreement by the end of this year. RCEP encompasses China, Japan, South Korea, India, Australia, New Zealand and the 10 members of the Association of Southeast Asian Nations. The cooperative framework would facilitate more trade and cross-border investment, as well as the movement of labor. Greater cooperation among Asia’s largest economies would be a shot in the arm for the global economy. According to a diplomat familiar with the negotiations, India said that if a basic deal on lowering tariffs was announced, the government in New Delhi would collapse. "Please wait until after the [Indian general] election," the source quoted the delegation as saying. India is expected to hold a vote by May. With agriculture employing 43% of the workforce, according to 2017 data from the World Bank, cutting tariffs on farm products is too touchy a subject for Narendra Modi’s government. Not only would opening the agricultural market directly affect India’s farmers, its manufacturers are not as competitive as those elsewhere. The likely result would be a flood of imports. "We are very happy that India’s concerns have been taken on board, and we feel that we should conclude in a way that will be long-term sustainable, so that every country will benefit," Indian Commerce Minister Suresh Prabhu told reporters Monday evening. With a per capita gross domestic product of around $2,000, lower than most other members, Asia’s third-largest economy is still developing. This made it difficult for India to agree to accept a free trade deal quickly. It already has a large trade deficit, 40% of which is with fellow RCEP member China. Implementing the deal could see that imbalance grow. "It is not to India’s advantage to be part of RCEP unless we have access to the services market in the other participating countries," former Commerce Secretary GK Pillai was quoted as telling the Hindustan Times newspaper last week. The report said Indian sensitivities include the prospect of more Chinese goods entering the country if it significantly opens its markets to RCEP nations. The Indian government on Tuesday issued a statement saying, "The commerce minister defended India’s interests effectively and secured maximum flexibilities," appearing to treat the announcement of no deal as a victory. India was not alone in its reluctance. Malaysia was closer to India’s position than to those pressing for agreement, such as Japan, Australia and New Zealand. Hindu Business Line, an Indian news outlet, reported that the Philippines and Vietnam also shared India’s view. "RCEP negotiations have to make room for certain constraints faced by member countries," Malaysian Prime Minister Mahathir Mohamad told reporters on Tuesday, noting that each country has its own issues. Indonesia’s trade minister, Enggartiasto Lukita, went further, saying Japan, not India, was the problem. "Since August, Japan started to force its interests on to others and although members tried to be flexible about it, Japan did not," he told reporters on Wednesday. Other points remain unresolved, with rules governing e-commerce, competition and investment among the most thorny. The question is whether RCEP members will be able to wrap up a deal next year. Some members, including Indonesia and Thailand, face the prospect of national elections in 2019. That could slow the talks down. "Given the value of the RCEP market, and the amount of effort already invested in negotiations, [the members] have an interest to move toward a conclusion once relevant concerns have been addressed," Locknie Hsu, a professor of law at Singapore Management University, told the Nikkei Asian Review. "A practical way forward may be to discuss and agree on possible timelines within 2019 for negotiations on each of the remaining chapters to be completed," Hsu said. Cassey Lee, senior fellow at Singapore’s ISEAS-Yusof Ishak Institute, is more doubtful. "I think some momentum is lost as the negotiations move beyond 2018. It is unclear whether RCEP can be concluded by next year," Lee said. Members are expected to hold the next round of talks in February in Indonesia. Nikkei staff writers Takashi Tsuji, CK Tan, Jun Suzuki and Kiran Sharma contributed to this report.